The Historical Association of Annapolis Royal will officially dedicate a monument honouring the Acadians who were buried in the cemetery between 1632 and 1755 during "The Story of Annapolis Royal" on October 5. On September 24, 1710, a British-New England expedition from Boston entered the Annapolis Basin and began the siege that resulted in the final British capture of Port-Royal. On October 5, 1710, the French handed the key to Fort Anne over to Francis Nicholson, Commander-in-Chief of the British expedition, who subsequently renamed the town Annapolis Royal in honour of Queen Anne. On October 5, 2010, you can step back in history and witness the surrender of Fort Anne and the renaming of the town as part of The Story of Annapolis Royal 1710 – 2010. This event, the culmination of a year-long series of programs and events marking the 300th anniversary of the renaming of Annapolis Royal, will take you back in time with an afternoon of historical re-enactments and vignettes written by Peggy Armstrong. It is proudly sponsored by the Annapolis Royal 300th Anniversary Society in partnership with The Historical Association of Annapolis Royal. The program begins at Fort Anne with a historical re-enactment of the events of October 5, 1710. Costumed characters will portray the British expedition, led by Nicholson, and the French garrison under the command of Daniel d’Auger de Subercase, Governor of Acadia, as the official transfer of Port-Royal took place. Subercase will present the key to the Fort (the original key from 1710 will be on display) to Nicholson, and the French flag will be replaced by the British flag. Port-Royal will henceforth be known as Annapolis Royal. From Fort Anne, the day’s events move to St. Luke’s Anglican Church, which is also celebrating its 300th anniversary this year, for a performance of A Public Scandal. In this short play – based on a true incident that occurred at the Fort in 1724 – a scandal involving the garrison chaplain results in citizens deciding to take matters into their own hands. 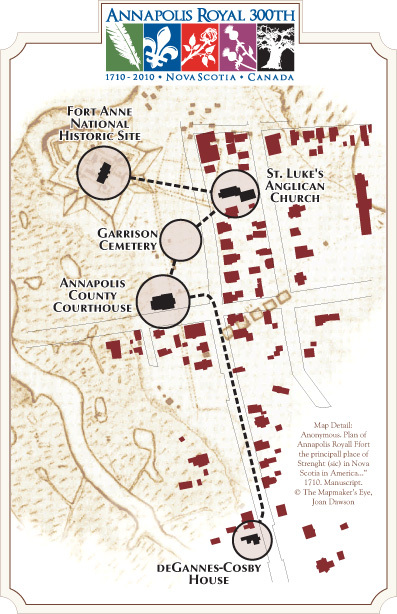 The program then moves to the garrison cemetery on the grounds of Fort Anne. This cemetery, which contains a tombstone dating back to 1720, is well-known as the oldest English graveyard in Canada. However, the site was also the official graveyard of the Acadian Catholic parish of Saint Jean-Baptiste from 1636 to 1710. Unfortunately, because the Acadians marked burial sites with wooden crosses, there are no existing markers to identify those early graves. 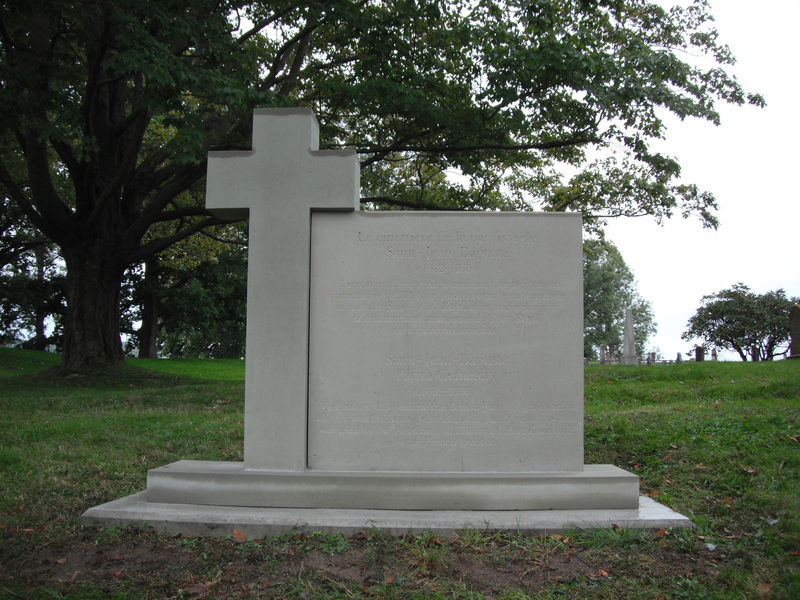 To honour the many Acadians buried at the site, the Historical Association of Annapolis Royal has commissioned a monument, created by stone carver Heather Lawson, which will be dedicated on October 5 as part of the 300th Anniversary program. The Story of Annapolis Royal 1710 – 2010 begins at 1:00 p.m. on October 5 at Fort Anne National Historic Site. Everyone is invited; there is no admission charge. Don’t miss this opportunity to relive a bit of local history. For additional information, please contact Linda Brown at (902) 532-2043 or Alan Melanson at (902) 532-2397. Note: The 1710 dates used in this article are from the old Julian calendar used by the British at the time. The French operated on the modern Gregorian calendar, which was eleven days behind the Julian calendar in the eighteenth century. This entry was posted in Arts, Dance, Explore Annapolis Royal, Heritage, Theatre, Tours and tagged Acadian, Annapolis Royal 300th Anniversary, Annapolis Royal Nova Scotia, Dance, deGannes-Cosby House, Fort Anne, Historical Association of Annapolis Royal, St. Lukes Anglican Church. Bookmark the permalink.